As long as the Dutch Kingdom exists (we started 1813, not that long ago), Bonaire has been part of it. For most of the time (since 1890) the kingdom has been ruled by queens. And they like to celebrate their birthdays worldwide, or at least as wide as the kingdom stretches. So on April 30 the whole kingdom celebrates Queens Day. The whole kingdom? No, not the whole kingdom. A little village in a faraway corner of her realm resisted the royal pressure and started its own Day: Rincon Day, some 22 years ago. I don’t know what caused it; the Bonairians are pretty loyal to their queen, but maybe the macho culture caused this act of rebellion against a female king. Anyway, Rincon Day has been a hit ever since. 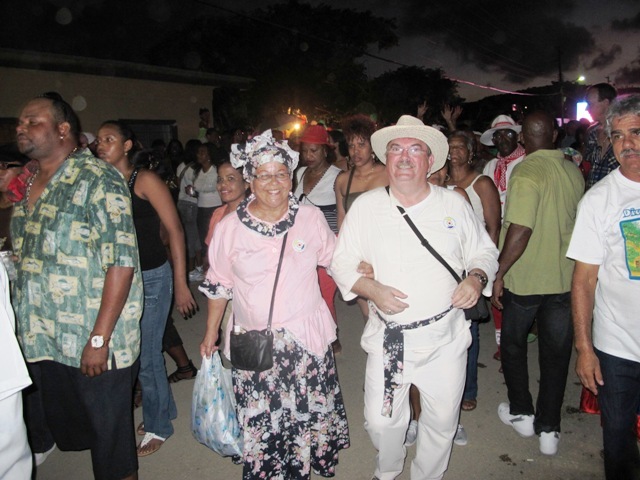 People from all over the Lesser Antilles come to Bonaire to enjoy live music, folkloric dancing, meeting each other, eat and … drink. Now there are different ways of getting to Rincon from my house in Kralendijk. I can go by car (dull), or join the 10 km run that starts at 7 in the morning and ends in Rincon (fatiguing), or join the Bonaire Bikers Club on their parade to Rincon. Now bikers all over the world know, that riding a motorbike means you will have an accident; you will fall. You just don’t know exactly when it will happen. That is why all over the world bikers use protective clothing and helmets. You probably guessed my choice how to get to Rincon for the last couple of Rincon Days in a row. Join the parade! It is great to join the other bikers in a tour over the island that ends in the centre of Rincon. Members of the Bikers club drive Harleys. My Yamaha is affably tolerated for the occasion, but it is clear I don’t really count. When we park the bikes in Rincon, spectators look at the bikes admiringly, but not at my Yamaha. I know my place, and join the celebrations. 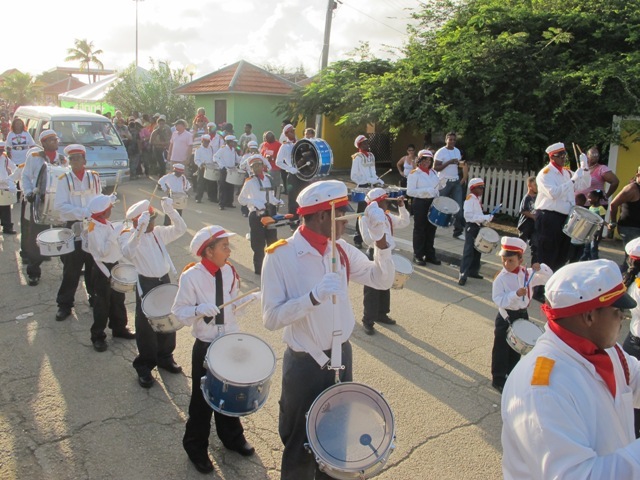 Rincon day is even bigger than Carnival in February or the Bonaire Day in September and everybody is having a great time. I chat with friends, help Rincon in the effort to get rid of all Polar beers on the island, eat excellent Kabritu Stoba (goat stew) and look at the colorful costumes of the dancers. When the parades start I see this is a family day. The drum band has all generations, the youngest must just have learned how to walk! And later everybody walks behind the trailers with live bands. When it is time to go it is already dark. Extremely careful I join the line of cars going back to Kralendijk. Thank God everybody is driving slowly and defensively on this dark road tonight. I survived another Rincon Day. This entry was posted in Bonaire, travel and tagged bonaire, motor bike, Rincon Day. Bookmark the permalink.